Chief O'Hallorhan: How do I get back down? Q: Lisolette Mueller remembers while fleeing the fire that she has left her cat in her apartment. What happened to it? 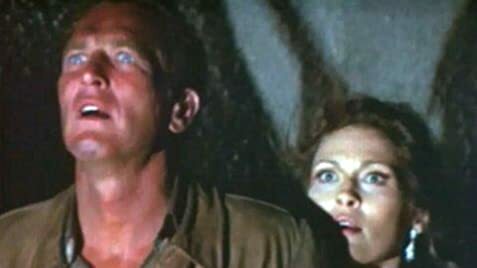 Your typical dumb disaster flick, produced by the king of the genre, Irwin Allen, made notable by the presence of Steve McQueen and Paul Newman who finally agreed to share the screen as equals, something they almost did in "Butch Cassidy and the Sundance Kid." The ever competitive McQueen made his film debut with a bit part in "Somebody Up There Likes Me" in which Newman starred, and one of his ambitions was to finally get top billing over his number one rival. Even with the so-called "diagonal billing" employed in the film and its advertising (with Newman's name elevated slightly above McQueen's), those of us who read from left to right can see that McQueen got his wish. 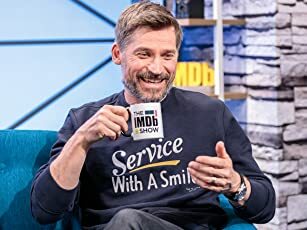 He also got the best role. He's the firefighter, a tight jawed man of action, while Newman is saddled with the less sympathetic role of the architect. But the real star is the burning building. It burns, and impressively at that, but there's something very claustrophobic about this situation which results in less action than Allen's previous smash, "The Posiedon Adventure." But the acting is better. In addition to McQueen and Newman, the cast includes Richard Chamberlain (particularly good), William Holden, Faye Dunaway, and Fred Astaire. That's an improvement over Carol Lynley and Eric Shea, both of whom Gene Hackman had the misfortune of emoting with two years earlier. 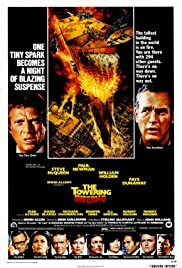 Whatever one thinks of this particular genre, "The Towering Inferno" is probably the best of the bunch.